Facial pain may be divided into several distinct categories, each requiring a specific treatment approach. In some cases, however, such categorization is difficult and treatment is ineffective. We reviewed our extensive clinical experience and designed an algorithmic approach to the treatment of medically intractable facial pain that can be treated through surgical intervention. Our treatment algorithm is based on taking into account underlying pathological processes, the anatomical distribution of pain, pain characteristics, the patient's age and medical condition, associated medical problems, the history of previous surgical interventions, and, in some cases, the results of psychological evaluation. The treatment modalities involved in this algorithm include diagnostic blocks, peripheral denervation procedures, craniotomy for microvascular decompression of cranial nerves, percutaneous rhizotomies using radiofrequency ablation, glycerol injection, balloon compression, peripheral nerve stimulation procedures, stereotactic radiosurgery, percutaneous trigeminal tractotomy, and motor cortex stimulation. We recommend that some patients not receive surgery at all, but rather be referred for other medical or psychological treatment. This treatment algorithm for the intractable facial pain appears to be effective for patients with a wide variety of painful conditions and may be recommended for use in other institutions. The term "facial pain" encompasses variety of clinical conditions ranging from very common (such as headaches and myofascial pain syndromes) to less common (trigeminal neuralgia – TN) and quite rare (glossopharyngeal neuralgia – GPN) (Table 1). Although clinical presentation of some of these conditions overlaps, the treatment approaches differ significantly based on etiology, nature and severity of pain, as well as its distribution, neurological and psychological variables, and medical co-morbidities . The diagnostic uncertainty was discussed in multiple publications previously and remains problematic [2–4] (Table 2). The list presented here is given for purposes of illustration of the algorithm described in this article. It is by no means comprehensive and the order of conditions does not reflect their incidence or severity. Recently, two in-depth clinical articles presented different modalities used in treatment of facial pain [5, 6]. One of them reviewed a single-institution experience with two most commonly done procedures that are used for surgical treatment of the trigeminal neuralgia . The other provided comprehensive review of currently available neurostimulation techniques that may be and are used for the treatment of facial pain . In this paper, we reviewed our single-institution experience with the treatment of the facial pain according to our definition of multimodality approach. 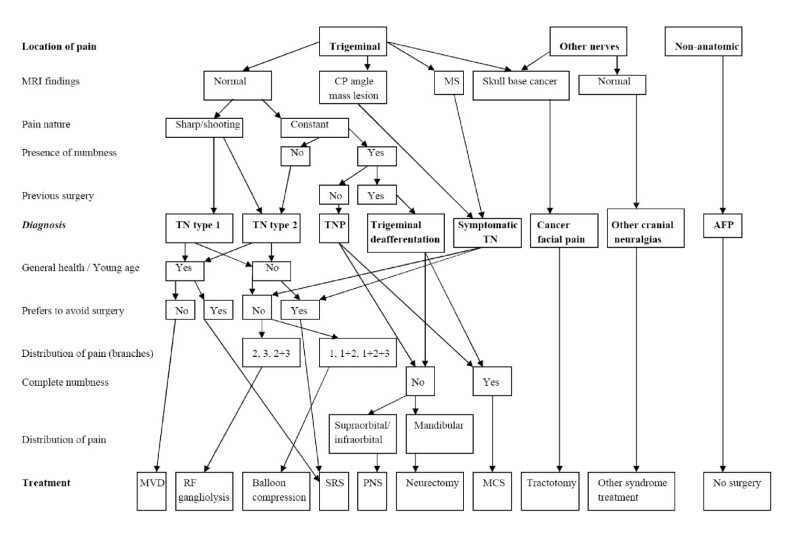 Since our clinical practice attracts a large number of patients with facial pain, we decided to create an algorithm for its surgical treatment and summarize applicability of such algorithm based on degree of pain relief and patient satisfaction. The analysis presented here was derived from a prospective study of patients with facial pain that was approved by our Institutional Review Board few years ago . The algorithm for treatment of medically intractable facial pain that we use is based on taking into account underlying pathological processes, the anatomical distribution of pain, pain characteristics, the patient's age and medical condition, associated medical problems, the history of previous surgical interventions, and, in some cases, the results of psychological evaluation. The largest part of our algorithmic approach to facial pain is, not surprisingly, dedicated to treatment of trigeminal pathology, including TN and other disorders of trigeminal system (trigeminal neuropathy, deafferentation, etc.). Surgeries for migraine and other headache syndromes are currently in an early research phase; dental and TMJ problems rarely come to neurosurgical attention but should be kept as a part of differential diagnosis in patients with chronic facial pain; non-trigeminal disorders (related to involvement of the glossopharyngeal, intermediate and occipital nerves) are significantly less common (at least in our practice) and, in most cases, may be diagnosed by specific distribution of pain that involves ear, throat, occiput, neck alone or in addition to facial territory. Importance of detection of the underlying pathological processes may be illustrated by difference in surgical management of various possible causes of symptomatic (secondary) TN (neoplasms, vascular malformations, etc.) that would require definitive treatment (such as tumor resection) in order to obtain pain control , or symptomatic TN caused by demyelination (as in multiple sclerosis (MS)) for which destructive procedures are considered to be a preferred treatment approach. In most cases of typical TN (TN types 1 and 2), where underlying pathology cannot be clearly identified, neurovascular compression is postulated to be a cause of pain (so called idiopathic TN), non-destructive procedure – microvascular decompression (MVD) – may be considered a treatment of choice, as this modality (a) provides the only curative solution, (b) is not associated with sensory loss as a result of surgery, (c) has very high success rate, and (d) is associated with the lowest rate of pain recurrence. Patient's age and medical condition become important in algorithmic approach to facial pain, particularly in those diagnosed with TN, since MVD requires craniotomy and carries certain risk of complications related to surgery and general anesthesia. This risk increases with the patient's age and associated co-morbidities. Therefore, for older and medically unfit patients, preference is given to less invasive percutaneous destructive procedures and stereotactic radiosurgery (SRS). Although MVD has been shown effective in elderly TN patients and those with secondary TN from MS, we do not routinely suggest it for these patient categories. This approach may reflect our institutional bias, but in the authors' opinion, the lower yield of MVD in MS and higher risk of complications in elderly patients undergoing MVD do not justify considering MVD as the first choice in these particular situations. Among percutaneous destructive procedures that are used for TN, each of three modalities (RF gangliolysis, glycerol injection, and balloon microcompression) may be used for idiopathic (TN types 1 and 2) and symptomatic (secondary) TN, but in our opinion, RF gangliolysis works best in those TN patients that present with pain in 2nd or 3rd division of the trigeminal nerve (maxillary and mandibular nerves) due to somewhat higher risk of corneal hypesthesia or anesthesia with resultant keratitis and corneal abrasions if 1st branch (ophthalmic nerve) fibers are targeted by RF energy. Therefore, balloon microcompression in our algorithm is reserved for patients with TN whose pain involves distribution of the first trigeminal branch (ophthalmic nerve) with or without other branches. SRS with Gamma Knife (or linear accelerator) is reserved for those patient with TN types 1 and 2 (typical and atypical TN) who prefer to avoid any mechanically invasive procedures (open or percutaneous interventions) and only if they can tolerate their pain for 1–3 months that are required for pain relief after radiosurgery. The nature of pain and results of neurological evaluation allow one to diagnose other pain syndromes involving the face and differentiate them from classic TN (TN type 1). For example, presence of constant pain, lack of response to carbamazepine, and associated numbness would put the patient either into category of "atypical TN (ATN)" (if sharp and shooting pain is present) or "trigeminal neuropathic pain (TNP)" (where pain is predominantly constant and the neurological deficit is more obvious). Both of these conditions may be classified as TN type 2 (if the pain is idiopathic), true TNP (if caused by unintentional or incidental trauma) or trigeminal deafferentation pain (if caused by previous deafferenting procedures – surgeries, injections, etc.) [3, 4]. MVD for patients in this category may be less effective than for those with TN type 1 (typical TN) and destructive procedures will have limited value only (this is true about both percutaneous procedures and SRS). For TN type 2 (ATN), the vascular compression is thought to be more distal, but for TNP in its broad definition (that includes neuropathic, deafferentation and post-stroke pains) the pain most likely represents partial or complete deafferentation from previous injury (either iatrogenic or traumatic) or cerebral infarction (thalamic strokes, lateral medullary infarctions – Wallenberg syndrome). The limited choices of intervention include (a) peripheral nerve stimulation (PNS) [9, 10] that works particularly good in TNP patients, (b) trigeminal tractotomy/nucleotomy [11, 12] that due to high risk of complications is reserved for patients with cancer-related pain and those with short life-expectancy, and (c) motor cortex stimulation (MCS) [13–15], which mechanism is not completely understood but which applicability for facial deafferentation pain has been repeatedly shown in multiple centers all over the world, including the United States. Atypical facial pain (AFP), on the other hand, does not follow clear anatomical distribution, frequently crosses midline, and, not surprisingly, almost inevitably correlates with presence of psychological aberrations. Patients with AFP do not improve with surgical interventions; therefore, it is recommended to avoid surgery and continue treatment with anticonvulsants and antidepressants as soon as the diagnosis is made. Other, less frequent pain syndromes, such as GPN , Eagle syndrome , Tolosa-Hunt, Raeder and Gradenigo syndromes, require completely different algorithm that also includes non-destructive and destructive options. Flow diagram of the treatment algorithm. If the patient has anatomical distribution of pain, determine if this distribution correlates with trigeminal territory or territory supplied by other nerves of face/head region (glossopharyngeal, n. intermedius, occipital); if it is limited to trigeminal area, proceed to step #2; if other nerves are involved, proceed with step #13; if pain is non-anatomical in character, proceed with step #14. If the patient's pain is limited to trigeminal distribution, define if it has features of TN – sharp shooting (electric-shock like) pain, triggerable by touch, speech, cold wind, etc., responsive to oral carbamazepine, with spontaneous remissions, pain-free intervals – proceed with step #3; if any of the typical TN features are absent, but the majority of pain is sharp and shooting in nature, proceed with step #6; if the pain is in trigeminal distribution but is primarily constant and is associated with certain degree of sensory loss, proceed with step #9; obtain MRI of the brain in all of these cases to rule out mass lesions and demyelination. If the patient has TN type 1 (typical TN) – as documented by TN features and brain imaging negative for mass lesions in the cerebellopontine angle and demyelination – the procedure of choice is microvascular decompression (MVD) through suboccipital craniotomy, independently of the trigeminal branch involved. In the situation described in #3, if the patient cannot have MVD due to advanced age (older than 70) or severity of medical condition, or if the patient prefers to avoid open surgical intervention, or if the pain recurred after MVD performed in the past, or if the brain imaging is suggestive of demyelination (e.g., MS), and if the pain involves 3rd, 2nd or 2nd and 3rd branches, the procedure of choice would be percutaneous stereotactic radiofrequency gangliolysis. In all situations described in #4 and if the pain involves the 1st branch distribution alone or in any combination with 2nd and 3rd branches, the procedure of choice is percutaneous trigeminal balloon microcompression. If the patient has TN with atypical features, (some numbness, presence of constant pain in addition to sharp shooting sensation, pain is unresponsive to carbamazepine), the most likely diagnosis is TN type 2, and the algorithm from #3–5 applies, but the patient is informed about higher chance of complications, including facial numbness and pain recurrence. If the patient's TN types 1 and 2 (typical or atypical TN) is associated with a mass lesion of the cerebellopontine angle, the surgery should address the mass lesion and the pain is expected to improve once the mass lesion is eliminated. If the patient fits description of steps #3–6 but does not want to have any invasive intervention, the option of choice becomes stereotactic radiosurgery with Gamma Knife or, less often, linear accelerator; the patient is informed about destructive nature of radiosurgery and the lag between the treatment and onset of pain relief (1 to 6 months). If the patient is diagnosed with the trigeminal neuropathic pain (not neuralgia), and maintains some degree of sensation in the area of pain, and the pain is localized to distribution of the supraorbital or infraorbital nerves, the treatment of choice is trigeminal branch stimulation with peripheral nerve stimulation technique. If the patient fits description of step #9 and the pain is localized to distribution of any branches of the mandibular nerve, the treatment of choice is neurectomy or nerve decompression or non-surgical management. If the patient has constant pain and complete numbness in the area of pain (anesthesia dolorosa) as a result of previous surgical deafferentation or stroke, and life expectancy more than 6 months, the treatment of choice is the contralateral motor cortex stimulation with epidural intracranial electrodes. If the patient has trigeminal deafferentation pain with sensory impairment (anesthesia dolorosa), or any type of cancer-related pain in the area of face, and short (less than 6 months) life expectancy, the treatment of choice is percutaneous stereotactic trigeminal tractotomy. If the patient's pain fits into category of other specific facial pain syndrome, such as glossopharyngeal neuralgia, cluster headaches, sudden unilateral neuralgiform pain with conjunctival injection and tearing (SUNCT), Eagle, Gradenigo, Tolosa-Hunt, Raeder, and other syndromes, a dedicated treatment modalities are considered outside of this algorithm. If the patient is diagnosed with atypical facial pain, the surgery is not recommended and the patient is managed by combination of anticonvulsants and antidepressants. Our algorithmic approach was used in 138 consecutive patients with medically intractable facial pain. The information about demographics, diagnoses and initial surgical interventions for these patients is summarized in Table 4. Clinical evaluations and diagnostic workups were followed in each case by the systematic choice of the appropriate intervention. The algorithm has proved easy to follow, and the recommendations include the identification of the optimal surgery for each patient with other options reserved for failures or recurrences. For example, among these patients almost two thirds (62%) had trigeminal neuralgia, majority of which may be classified as a TN type 1 (typical idiopathic TN), and the remaining group was divided between the symptomatic TN (due to neoplasms and multiple sclerosis) and TN type 2 (atypical idiopathic TN). Only few patients had other cranial neuralgias and syndromes, and the incidence of TNP and AFP was about 10% each. The number of MVD and RF gangliolyses was approximately the same; RF gangliolysis was done as a repeat procedure for pain recurrence in 9 cases after previous RF ganglilolysis and in 3 cases after previous MVD. Balloon compression was used only on five occasions and only in patients with TN and pain involving 1st branch distribution. Relatively recent acquisition of Gamma Knife is reflected by its relative underutilization in our practice, but this modality is expected to be used in about 25% of all TN patients. PNS approach [9, 10] was used only in patients with TNP due to post-traumatic or post-surgical neuropathy (trigeminal deafferentation pain). MCS  was used in those with facial pain after thalamic infarctions and with anesthesia dolorosa (an extreme case of trigeminal deafferentation pain developed as a complication of previous interventions for treatment of TN). Computed tomography (CT)-guided trigeminal tractotomy is considered only in patients with short life expectancy and is rarely performed. Patients with atypical facial pain (AFP) were not offered any surgical intervention, mainly on the basis of its ineffectiveness in suppressing AFP symptoms and risk of unwarranted complications. The patients understood the rationale for avoiding the surgery and proceeded with medical treatment, usually including anticonvulsant and antidepressant medications. In addition to this, several other patients with different pain conditions were advised against surgery or chose not to have operations for various reasons. The treatment algorithm for the intractable facial pain described in this paper appears to be effective for patients with a wide variety of painful conditions involving the face. It applies to vast majority of patients presenting to a neurosurgical clinic and is associated with extremely high degree of pain relief and patient satisfaction. Therefore, in our opinion, it may be recommended for use in other institutions for subsequent validation and wider adoption. KVS conceived the article, treated all patients and wrote the article; HN, MEC and NM collected the data, participated in data analysis, and participated in manuscript drafting. All authors read and approved the final manuscript.